The UMFT51AA is a development module for FTDI’s FT51AQ, one of the devices from FTDI’s range of microcontrollers with USB interface bridging features integrated. FT51A is a MCU series which includes the following features:USB client and USB hub interfaces, 8051 core, 8-bit ADC, UART, SPI, I2C, 245FIFO and PWM. The UMFT51AA is a module which is designed to plug into a standard 0.6” wide 40 pin DIP socket. The UMFT51AA is built with a FT51AQ; many of the features of the FT51AQ can be utilized with this module. Integrated clock generation, no external crystal required. PCB assembly module is designed to fit a standard 15.24 mm (0.6”) wide 40 pin DIP socket. Pins are on a 2.54mm (0.1”) pitch.This module is a drop in replacement for an 8051 microcontroller. An on board USB type A socket and plug allow modules to be connected to a PC via a standard A extension cable or directly. 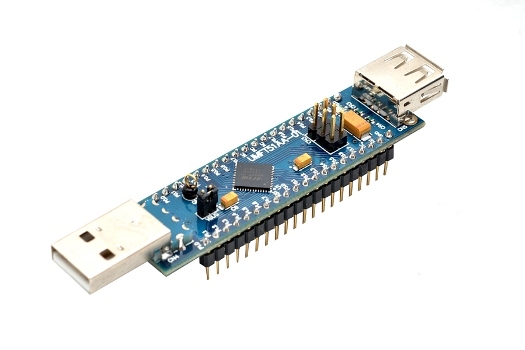 This module is also capable of cascading several modules by utilizing the USB hub feature. Debugger interface header used for debugging and programming the FT51AQ. Designed for operation with the FTPD-1 programmer/debugger module. Onboard jumper for configuring the FT51AA to be in selfpowered or USB powered modes.